Coffee Pods – The Angel or The Devil of the coffee world? Coffee Pods have taken the world by storm with their simplicity. They are small plastic or aluminium pods that are capped with foil or filter paper, containing a set amount of coffee grounds. These pods are inserted into a machine which will quickly fill a cup with coffee. According to The Grocer, “in the last year, more than £112m-worth of coffee pods were sold in the UK, up by a third from 2014.” It is quite easy to see why these small pods are so popular; just take one, put it in your machine and once its done throw it in the bin, right? Although these coffee pods seem like the perfect solution for when you need a quick caffeine hit; some environmentalists believe they are having huge effects on our planet. Fully compostable coffee capsules are available and have been for some time. However, a lot of people aren’t recycling them properly. Instead, they are just throwing them in their rubbish bins. Concerns have grown so bad that in the German city of Hamburg, they have banned consumers from purchasing ‘certain polluting products or product components.’ This ban has specifically singled out coffee capsule machines which account for “one in eight coffees sold in Germany”. The people of Germany aren’t the only ones who are concerned about coffee pods. In a study by the BBC, they found that one in ten Britons said that they believed “coffee pods are very bad for the environment.” However, 22% of those people asked said they have their own coffee capsule machine. To tackle this issue, Nespresso have their own recycling programme where they are actively picking up used capsules and recycling them. A spokesperson for the company said to the BBC they can “currently recycle up to 80% of used capsules, with 14,000 sites dedicated to coffee capsules across 31 countries. Our aim is to get this to 100% by 2020.” Good job guys! There is also price to consider; most companies will charge between 29p and 38p per capsule, with each one containing around 5.5g of coffee. After you’ve done the maths, this is the equivalent to £69 per kg of coffee. If you take our coffee, for example, we pack between 250g – 1kg of coffee in our bags and the cost varies from £7.95 – £28.95. So although coffee capsules are convenient, does the price of them tip the scales? 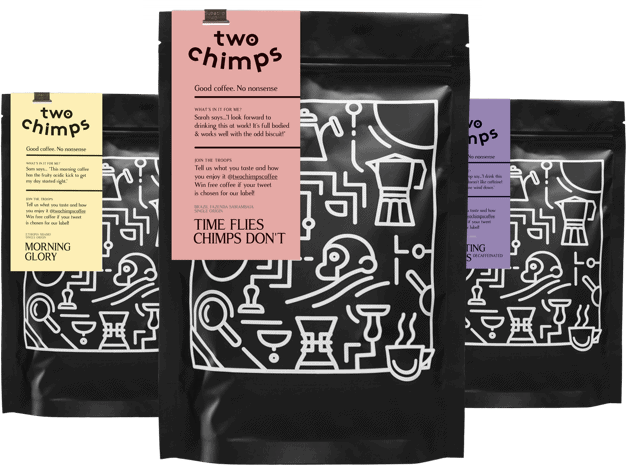 Unlike the coffee pods price of 29p to 38p per capsule, Two Chimps Coffee is approximately 20p per cup. Companies that sell coffee pods often have a delivery charge or a minimum order quantity added to the overall cost, which may put some off from buying them. Here at Two Chimps Coffee, we offer our customers free 1st class delivery on everything and there is no minimum order. So our coffee is cheaper per cup, and you will save on delivery. Not bad for a couple of chimps eh? We love the environment and making our planet a healthy place to live. Rather than throwing your spent ground coffee in the bin, we suggest using these coffee grounds in your garden or to add to your compost pile. To find out more check out our postGreat News For Green Fingers. But it doesn’t end there! The labels that go on every bag of coffee are fully recyclable too as they are printed on uncoated paper. Unfortunately, at present, our bags are not, but we are continually investigating different methods to allow them to be recyclable. With pods, you can never be too sure as to when these were roasted and packed. All of our coffees are roasted fresh and by hand multiple times a week, to assure you of the freshest cup of coffee possible. These are roasted proudly by ourselves and not sent away to be roasted. As mentioned, we don’t have a minimum order as we believe it is better to buy your coffee as and when you need instead of buying it in bulk. This will keep your coffee fresh. We also don’t offer any significant discounts for bulk orders for the same reason. Little and often means fresher, better coffee. Don’t forget that free 1st class delivery too! If you are looking at ‘making the switch’ from your coffee pod machine, there are some brewing devices out there that are both environmentally friendly and produce an excellent cup of coffee. The V60 Coffee Dripper is every speciality coffee drinkers dream. This device filters your coffee and brings out flavours in your coffee that you might not have noticed before. Its interior ridges help with airflow during the brewing process. Place the filter paper into the v shape, and the brewed coffee drops into your cup. If you choose to use natural filters, you can compost any waste that is left over. Cafetieres are one of the most popular in the big world of coffee. They work by using a plunging method in which your ground coffee is mixed with water. They are then left to infuse for around four minutes. After this, slowly push the plunger down which will separate your brewed coffee from any grounds. There is no waste with a cafetiere so just give it a quick clean, and it will be ready to use again. Handpresso’s are handy devices to have if you are out walking for the day or just fancy a quick and easy coffee. They don’t need any power, just some boiled water and freshly ground coffee. To make, apply pressure by hand in a similar way you would using a bike pump. Add your hot water and coffee, press the ‘go’ button, and there you have it – an awesome coffee. Top with hot water, milk or if you fancy a quick caffeine hit, drink as is. A perfectly extracted espresso. So if you only have a minute to spare (we aren’t joking, that’s how long it takes to brew! ), this is an ideal device. If you don’t want to run out of coffee again, have you thought about having a coffee subscription? You can choose how often we send your coffee to you whether its weekly, fortnightly or monthly. It will be sent to you automatically, so you don’t have to remember to order it. We also freshly grind your coffee for whatever device you use. We can also deliver it to you whole bean if this is preferred. Intrigued? Have a read over our subscription page and get stuck in! If you’re not sure what coffee is best for you, use our coffee finder, and you’ll be glad you did.